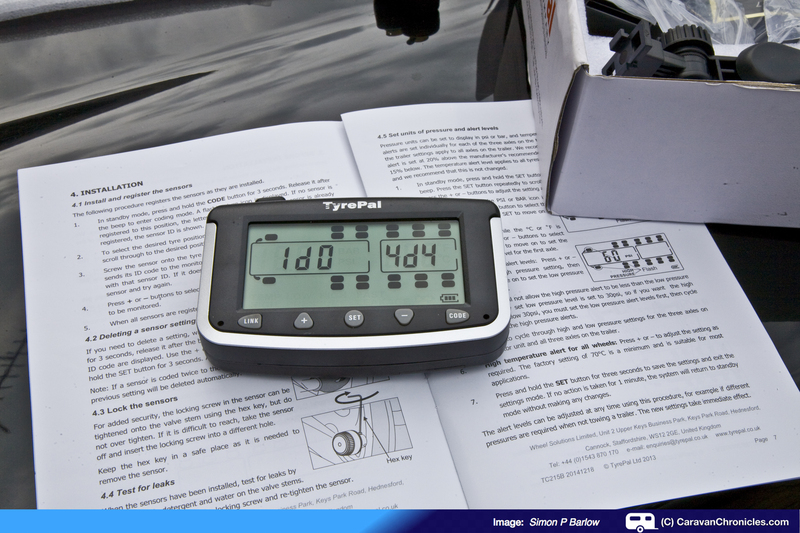 We had chance to test the TyrePal TPMS on a recent trip. The unit lent to us for review by Tyre Pal was the TC215B and included wheel sensors for the car and caravan. The kit arrived in a sturdy box with all the items you need, including two small allen keys for locking the sensors in place on the tyre valves, and spare hex screws used to lock the sensor just in case you have the misfortune to lose one. 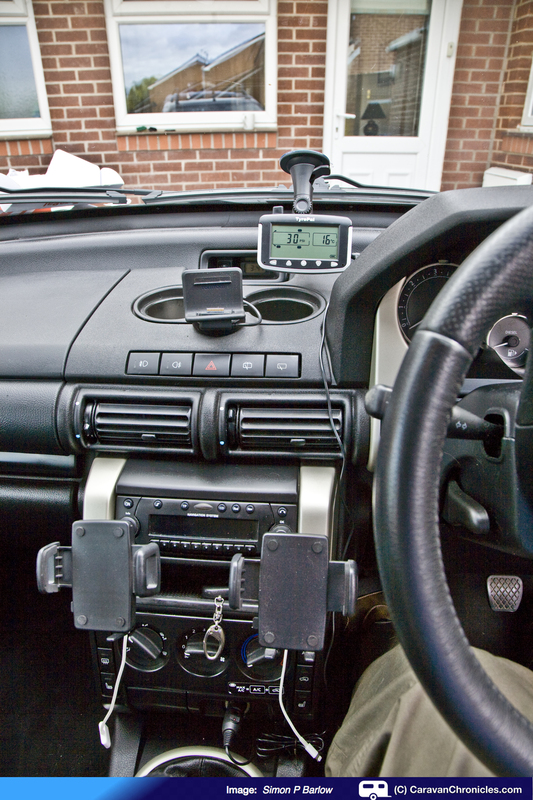 The unit itself has a rechargeable internal battery that will run the unit for around 60 hours of monitoring and there is a 12 volt charging lead supplied that simply connects to the unit and plugs into any 12 volt cigarette lighter socket. To mount the display there is a handy suction mount that will hold the unit in almost any orientation, and the sucker unit in use is really quite strong. Reading the installation manual it looked like a lot of button pushing to set up. 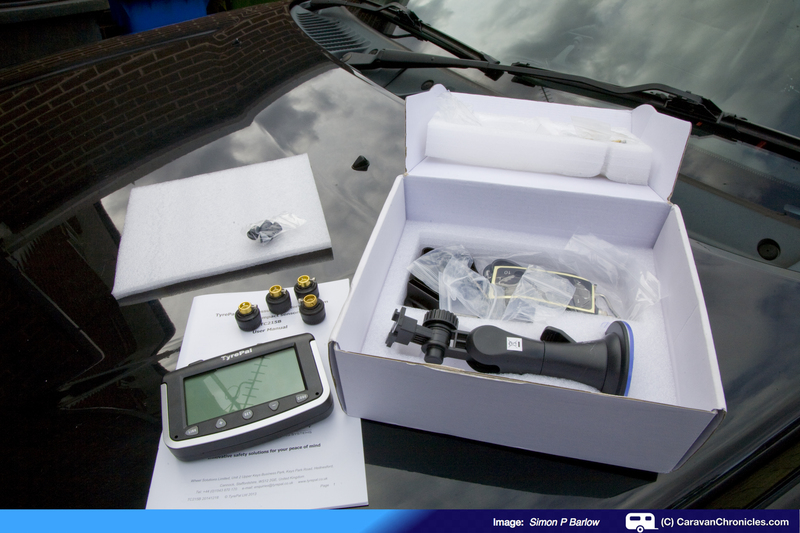 However in reality it was ridiculously simple and I had the 4 sensors installed in the Freelander in less than 5 minutes. The first step is easy, remove all the existing valve dust caps and check your tyre pressures. I followed Land Rovers recommendation for the tyre size and type for towing and set the pressures to the correct reading, checking with my digital tyre pressure gauge. Step two: lay out everything you need out of the box, and have another read of the instructions. The TC215B unit can monitor up to 22 pressure sensors and will allow you to configure tag axle motorhomes, twin wheel vans and up to three twin wheel axles on a trailer. So that should just about cover any combination imaginable. The sensors are interchangeable and can be registered at any of the 22 positions. Once all the sensors have been registered, only the tyre positions used are displayed. In standby mode press and hold the ‘CODE’ button for three seconds and release it after the beep…. To register a sensor simply screw it on to the valve stem and within a few seconds the code number for that sensor is displayed on the screen. Press either the ‘+’ or ‘-” button to move on to the next wheel…. it’s position is indicated by it flashing on the screen…. and screw on the next sensor for that wheel. Repeat until all the sensors are installed. When all the sensors are registered press and hold the ‘CODE’ button again to exit. Step three: Well there isn’t one – it’s that simple to install. The only other thing you need to do is set the high and low pressure alarms and high temperature alarm which again is really easy to do. The instruction booklet takes you through this and a recommendation of setting the high value at 20% above the recommended pressure and 15% below. Likewise setting the temperature alarm is simple but I left it at the factory default of 70’C. The only other thing to do is check for leaks and tighten up the lock screws on the sensors. Conveniently there are 4 positions the lock screws can be located and you might need to move the screws into different positions depending on the wheel rims. In practice on both the Freelander wheels and the Sterling caravan wheels I didn’t need to reposition any of them. Like anything, sometimes the published figures don’t work in the real world and I was sceptical about the unit being able to detect the sensors on the caravan. However, in this case, we never had any problems with a loss of info from any of the sensors. The caravan wheels are about 25 feet from the display and were picked up without issues. Maybe it was the OCD side of me but there was 1 PSI difference in the front tyres and I wanted them both the same and it took a bit of adjusting the pressures to get them both the same. Probably being pedantic about it really… but that’s me. It was interesting to see the unit in action. As we joined the motorway to head south from Manchester to Plough Lane caravan site near Chippenham, the tyres on the Freelander increased pressure by about 3 PSI at the front and 3 PSI at the rear while the caravan tyres increased pressure by around 4 PSI. This remained fairly constant until we reached some slow traffic at the M6/M6 Toll junction and slowing down using the brakes increased the caravan tyre temps by around 10 degrees. Now this struck me as being rather useful info simply because during the 80 or so miles driven so far the caravan tyre T’s & P’s had remained stable… if the simple act of slowing down using the brakes gently made that much of a change, then keeping an eye on any temperature difference between the left and right tyre would be a good indication of differential braking on the caravan axle… either one brake binding or not braking at the same efficiency as the other. This is now getting us into Formula 1 levels of sophistication… well a few steps towards it, but the information is there and leads to a better understanding of what’s going on and early signs of any potential issues. Off the motorway it was easy to see other things as well. On A roads with lots of stop starting, the front tyres were doing all the work (The Freelander, although 4 wheel drive is not permanent 4 wheel drive but front wheel drive unless a loss of traction on the front axle causes the centre diff to transmit power to the rear axle) and this could be seen in the increase in T’s & P’s over the rear axle, especially on a couple of steep A road climbs. On twisty sections, the rear tyres, as expected, were working harder and you could see the changes there too. With this information, it was now easy to see how you can keep an eye on what your tyres are doing. After all, in total you probably have less than a square foot of rubber in contact with the road and knowing a bit more of what is going on makes sense. In December, if you are planning a trip down to the warmer climate of Southern Europe it is handy to know that you might have to adjust your tyre pressures. Checking your tyre pressure on a frosty morning before you head south will probably mean that some adjustment is required when you get there. 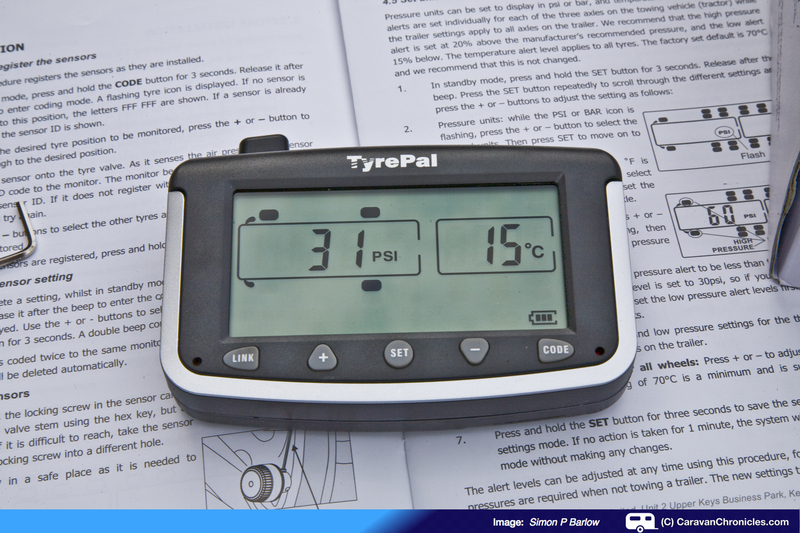 Tyre Pal is a handy “aide memoir” to remind you to check… and of course adjust again as you head home! TyrePal earns you 5% discount on your insurance premium. Is it just a gadget or a must have? On the face of it, it seems like another gadget, but I’d argue that it is more than that, it’s a must have. 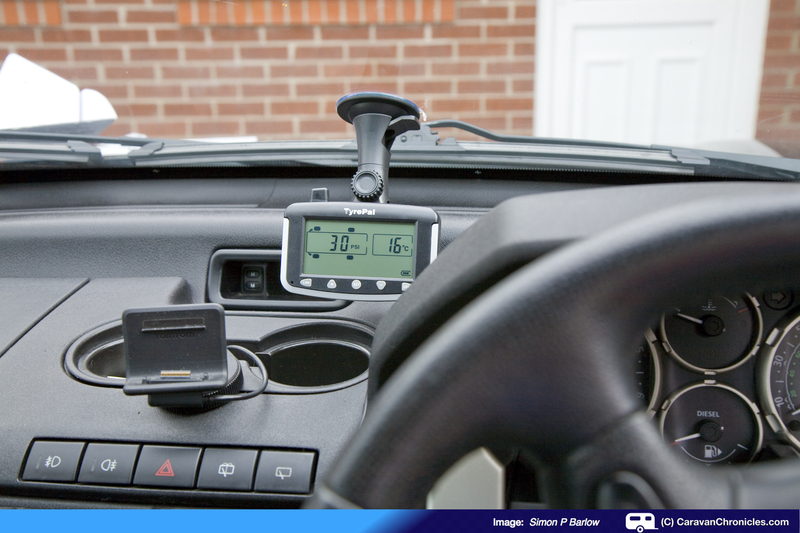 A device that not only tells you if your tyre pressures are correct and warns you if there is any change… either a slow leak or relatively fast leak that may not be apparent especially on twin axle caravans or tag axle motorhomes, but could also give you an indication of any brake imbalance. I’m not a tyre technician or expert in any way, but I’m sure that a fuller understanding of tyre temperature affects on performance and tyre life must be important… well it is to the Formula 1 guys at least. I don’t know if you can detrimentally over heat tyres, all I do know is if the pressure is wrong or the tyre is overloaded they do get hot and having some indication of this before there is smoke or blow-out has to be a good thing. If anyone uses a Tyre Pal unit already and has first hand experience of it saving the situation, please comment below. With the launch of the new third generation Unicorn range, Bailey has become the first caravan manufacturer to add tyre pressure monitoring as a standard feature to their new model. Each Unicorn caravan comes “TyrePal TPMS Ready” with internal sensors factory-fitted inside the wheels. So all the user has to do is simply purchase a monitor. Now this to me is a leap forward and proves that this isn’t a gadget as Bailey recognise the importance of the tyres and tyre monitoring. I’d like to see other manufacturers offering this as standard or at least a factory option. Unusually I’m looking forward to the drive home… not because I’ve not enjoyed our time at Plough Lane, but I’ll be looking to learn more about my tyre performance and the monitoring of them. OK, the big question… well the unit we have has been loaned to us by TyrePal and I must admit once the review is over I don’t want to hand it back! We have the 215 and it does al the above. The only annoying aspect is that it can take 2 – 3 miles to wake up and if on an A road and it reflects low pressure, you have an issue as you canot pull over. Luckily we have a twin axle. Other than that it works okay. The unit we have seems to wake up within a few hundred feet of setting off. I set up the high and low pressures and it reads OK within a minute or so without any problems. Very interesting. However I have to increase the pressures on my vehicle each time I tow and decrease when solo. Is this provided for in the setting up or have I missed something in the posting. Good question. Easy to answer though. I set the unit up so that the high pressure warning was 20% above the towing pressure for each of the Freelander axles and 15% below the normal solo pressure for each of the axles. For the caravan I just set it for 20% above and 15% below the recommended 62 PSI for our caravan. 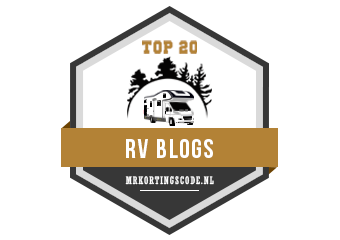 This means I don’t have to adjust the alarms when I change from solo to towing.There is also a facility on the unit to turn off the trailer readings when solo by pressing the link button. Thanks for speedy response. Will give it some thought and maybe make some hints! I think that using budget tyres has a significant effect on readings. Three of our tyres are the cheap budget tyres suplied with the caravan and the fourth is a mid range tyre. The three budget tyres show significant increases in tyre pressure and temperature. The pressure and the temperature on the Falken tyre hardly changes. We are considering upgrading our tyres to Goodyear tyres next year. On the trip home I had chance to do a bit more thinking and comparing readings. We have Michelin Latitude Cross X on the Freelander that have less than 500 miles on them and the general pressure and temps only varied front to rear axles. On the caravan we have Hankook’s (original fit) and again they were fairly matched in any changes. Not being a tyre expert, I think you may be right. A cheaper tyre will I suspect have a lower quality carcass and therefore be under more stress and flexing than a tyre with a higher quality construction given the same loading. 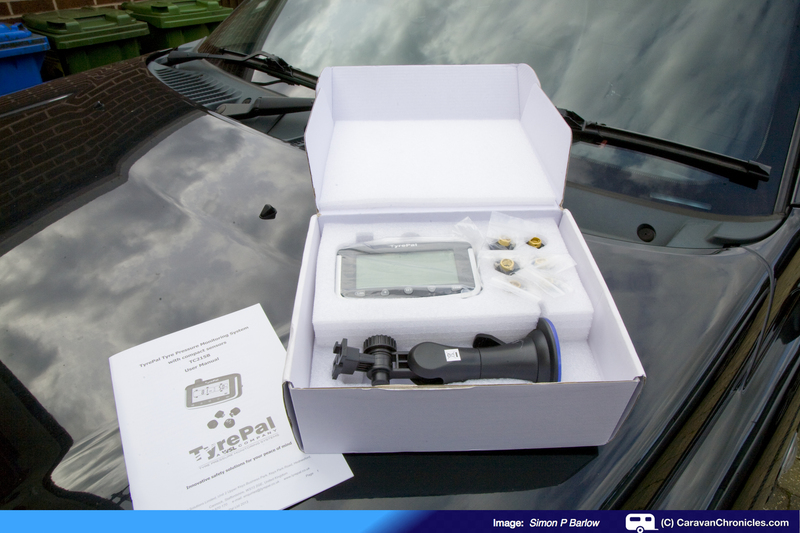 I have been using the Tyrepal 215b sensors on my twin axle caravan for a few trips so far. The recommended pressures for my twin axle seem to be quite a lot lower than those you quote being 33psi. The pressure very quickly rises on movement to 36psi then creeps up to through 37psi to 38psi and on a hot sunny day to 39psi. Interestingly the front tyres of the caravan almost always go up to 1psi above the rear tyres. As well on a sunny hot day on a long drive in the same direction, the sunny side of the caravan tyres will likely be 1psi above the other side. Above, Ian commented about the wake up time for the sensors and that does replicate my experience. If the sensors are freshly fitted or refitted after topping up the pressure, they respond very quickly, but after sitting on a pitch for 10 days or so they may take a few miles to register. As for tyres – just a comment a bit OT as it is car related – my Santa Fe has Hancook tyres as did my previous Santa Fe. On that previous one the original Hancook tyres did (front) 25k miles (rear) 52k miles and that is changing at 3mm below which I will not go. On the front, I dd try Michelin PIlot and they lasted just 13k and then Bridgestone Dueler which again lasted just 13k – given the premium price I was shocked. We had a tyre pal system installed on our motorhome. The manual mentions the possibility of the brass sensor reacting with valves made of other metals. Since the Peugeot boxer cab of our motorhome utilises aluminium based valves, I checked the valves every 4 weeks to ensure no binding. However after a short trip out in February, the front near side valve and sensor had seized together. Probably due to the road salt acting as an electrolyte. Eventually managed to get the sensor off but it destroyed the valve thread. So a word of warning, make sure you use a bit of copper slip on the valve threads.